So Christmas and New Year have passed and the school holidays still have a few weeks to go. 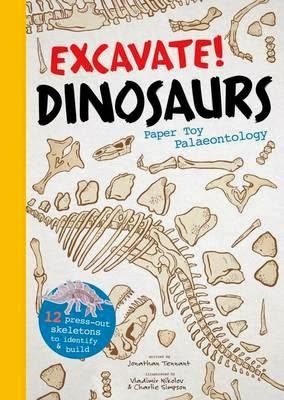 If your young ones are dinosaur enthusiasts, however, then you're in luck, as this awesomely wonderful activity book is sure to keep them occupied for hours if not days! Starting with a brief explanation of palaeontology, Excavate! Dinosaurs then goes on to examine the Triassic, Jurassic and Cretaceous periods before giving a detailed guide to twelve of the most amazing dinosaurs that once lived on Earth. From Triceratops horridus to Allosaurus fragilis, each dinosaur is beautifully illustrated, while fascinating facts provide plenty of 'Did you know …?' fodder for the aspiring palaeontologist. This is a beautifully produced book that's perfect for slightly older kids to tackle by themselves; younger readers will need the help of a handy adult.